Why You Should Google Yourself #infographic ~ Visualistan '+g+"
What you can see from Googling your own name is what everyone else can see, from concerned employers, potential dates, and even cyber criminals. In a future where a predicted 55 gigabytes of new data will be created per person every day, safeguarding your personal information has never been more essential. Flocking to social media sites to share photos, hears news updates, and chat with friends and family, 68% of Americans have an active Facebook account. With ample opportunities for oversharing, many of us have fallen into the too-much-information trap at least once or twice. Oversharing can put us at risk for more than just embarrassment; it can help scammers and cyber criminals get a deeper look into our online habits, insecurities, and vulnerabilities. From there, we become at risk for targeted phishing scams and personalized catfishing attempts. Keeping your data under wraps online is not only an essential, but also a responsibility. 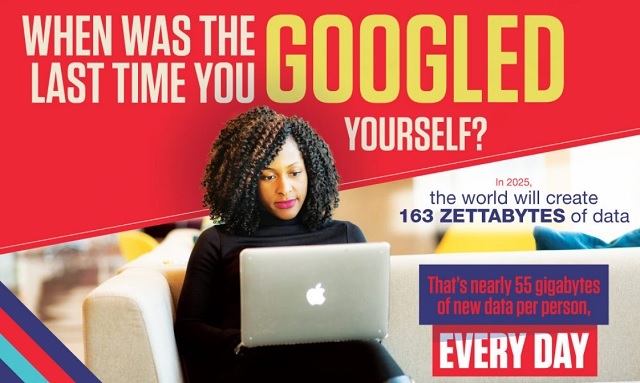 Take a look at this infographic for more on controlling your data online, managing your privacy settings, and just how far one Google search can go.